How much does it cost to travel to Hoi An? How much money will you need in Hoi An? d979,670 ($42) is the average daily price for traveling in Hoi An. The average price of food for one day is d171,049 ($7.37). The average price of a hotel for a couple is d1,060,236 ($46). Additional pricing is in the table below. These average travel prices have been collected from other travelers to help you plan your own travel budget. How expensive is Hoi An? How much money do I need for Hoi An? 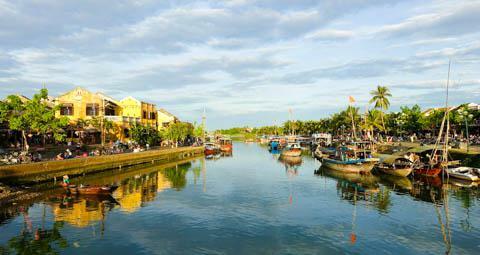 Located just south of the city of Da Nang, Hoi An is famous for it's beautiful old town. It is also a UNESCO World Heritage Site. Unfortunately, since its designation as a World Heritage Site in 1999, mass tourism has grown and the city has felt the growing pains. Most of the homes and shops in the old town are now used for commerical purposes. The city is still quaint, but the old town is lined with tailor shops and stores. Foreigners are required to purchase a ticket to enter the old town. There are many historic sights that are in Hoi An's old town. The town operates on a coupon system and for a set price you can get a ticket to visit five attractions including museums, old houses, assembly halls, and workshops, as well as the Japanese Covered Bridge or the Quan Cong Temple. The Japanese Covered Bridge is free to cross without a ticket. It was built in the early 1600's by the Japanese community and is a major landmark of the city. Popular museums around town include the Museum of Folk Culture, the Museum of Trade Ceramics, the Hoi An Museum of History and Culture, and the Museum of Sa Huynh Culture. The historic houses include the Phung Hung House, Quan Thang House, and Tan Ky House. Other sights include the Cantonese Assembly Hall, Hokien Meeting Hall, the Chinese All-Community Meeting Hall, the Hoi An Handicraft Workshop, the Traditional Theatre, and the Swan Boats. Most visitors spend the majority of their time in Hoi An's Old Town. This area is quaint, but commercialized. It has a main road cutting through it called Tran Phu that is lined with stores and shops. To the south of town, across the Thu Bon River are two islands: An Hoi is to the west and Cam Nam is to the east. There's also a nice beach near Hoi An that many travelers choose to visit for a day. The best way to make your way there is to either hire a bicycle or motorbike. Alternatively, you can take a taxi, but these are usually more expensive and can be somewhat more difficult to find. The beach itself is nice, but you are likely to be harassed by vendors, so the experience may not be as relaxing as you had hoped. There are some shacks and cafes by the beach where you can pick up a decent lunch while you're relaxing on the beach. If you find yourself in town on the 14th or 15th of a lunar month you'll get to see a good number of activities in celebration. These include traditional games like bai choi, trong quan, and dap nieu, which are played out all over town. Another popular activity in Hoi An is to have the city's tailors make you some articles of clothing. It's fun to flip through the books they have on hand and select some items of your choosing. They'll take your measurements and within a couple of days you'll have some tailor made cloths. Hoi An itself is a very romantic location, as the streets are lined with old buildings full of interesting shops. Hoi An makes a great destination for a Honeymoon in Vietnam, too, as it is affordable, fun, and it also has some nice beaches nearby. Hoi An is also famous for its local cuisine. There are local specialties that you should definitely try while you're in town. Cao lao is a rice noodle dish that is topped with roast pork, dough fritters, and some veggies. Another favorite is called white rose, which is a unique form of a shrimp dumpling. Wonton dumplings are also common and are usually served in a soup or deep fried. The Central Market is a great place to grab food from food vendors. You'll also find plenty of pubs and cafes along the river. Prices at restaurants in the center of town are higher, but in general you can get a decent meal for a low price at most places. Still, as tourism continues to thrive in Hoi An, prices continue to go up. It's really easy to walk around the old town portion of Hoi An. The entire area is pedestrianized during the day time, making it a fun place to wander, but keep your wits about you in the evening hours when motorbikes are more common. Like elsewhere in Vietnam, motorbike rentals are available. Negotiate hard for the price and ensure that the bike is in good condition before you leave. Make sure you are given a helmet as there is a fine if you don't wear one. Also remember that foreign international driving licences are not valid in Vietnam and you will be at fault if you are in an accident. Both car taxis and motorbike taxis are available. Taxis are available at the middle of Le Loi Street. Negotiate prices hard and you can still expect to pay a significant markup. Hoi An is known for three great things: the unique local food, the many clothing tailors, and the interesting old town full of old buildings. The local food is to die for. Try it all, and try it a lot. It's often really cheap. For one meal, we ate a huge amount of delicious soup dumplings for under $1. There's also a nearby beach that you can visit by taking a motorbike taxi. You might have to pay to sit on the beach depending on where you go, a lot of the beach land is privately owned.